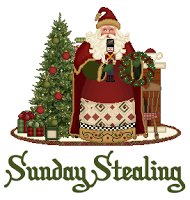 This week's Sunday Stealing comes from the Sunday Stealing archives! 1. Do you send Christmas cards? I send Christmas cards via snail mail and via the internet. 2. How soon do you start shopping? I usually shop the week of Christmas. 3. Who do you shop for? I shop for my dog and family. 4. Do you put up a Christmas tree? Some years I do. I did not put one up this year though. I am not really in the Christmas spirit. 6. Do you like tinsel? No. Tinsel gets everywhere and I am afraid the dog will eat it. 7. Do you use homemade or store bought ornaments? Store bought. All of my homemade ornaments have been lost or destroyed. 8. Do you put Christmas lights outside your house? Some years I do. But not this year or the last few years. 10. How about popcorn and cranberries? Yes. 11. Is there a wreath hanging on your door? Yes and here is a photo. 12. Do you hang up your stocking? No and I have not in many years. 13. Does your family read "Twas the night before Christmas?" We did when the kids were little but not any more. 17. Christmas Memory: Going to Grandma and Grandpa's house on Christmas Eve so that "Santa" could visit our house while we were gone. 20. White Lights or Colored Lights? White lights....they are so peaceful. 21. Blinking Lights or Still Lights? Still lights. Blinking lights give me e headache. 22. Were you Naughty or Nice this year? Nice of course. I have no reason to be naughty. 23. What do you want for Christmas this year? Peace, quiet, happiness and good health for all. 25. What's the best gift you've ever gotten? Stuffed animals (as a kid and as an adult). I loved stuffed animals, especially moose and teddy bears. 26. What's the worst gift you've ever gotten? A sweater that was way too small. 27. Who gives you the most gifts? My mother-in-law. 30. Do you put change in those red buckets? Sometimes. 32. Can you name all the reindeer? Yes. 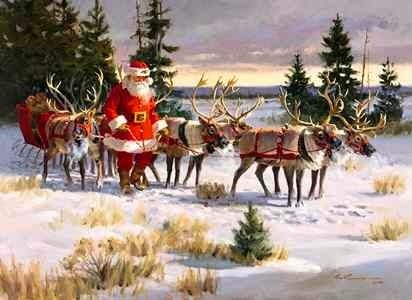 Dasher, Dancer, Donner, Blitzen, Comet, Cupid, Prancer, Vixen and Rudolph. 33. Do you bake cookies? Sometimes. 40. Where do you celebrate Christmas? At my in-laws house. 41. Have you ever had a white Christmas? Yes, many. 42. What part of Christmas do you look most forward to? I look forward to Christmas being over. The hustle, bustle and crowds drive me nuts. Christmas is very hard on me and always has been...negative memories far outweigh the positive. I shall hope you have a good Christmas, and that you find comfort when it is over. Be blessed. I hope you're able to create some wonderful memories this year. White lights are very peaceful, and what a great observation. I love the background of your blog. It's very sweet. Merry Christmas to you. May it exceed your expectations this year! I bought a ton of dog stuff today since most of their toys have been annihilated in my back yard. Time to start the new year with new toys.